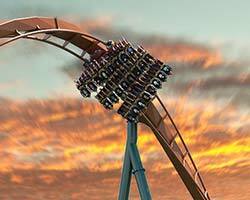 Have some questions about all the fun you can have at Canada's Wonderland? Well, you've come to the right place. Here's a list of some of the most common questions we hear from our guests. Take a look and see if you find what you're looking for. Canada’s Wonderland offers ample parking adjacent to the Park. Parking for autos and vans costs $22.00 (tax included) per vehicle when you purchase online. Parking for RVs and campers is $30.00. Disabled parking is available. A drop-off and pick-up area is located on the east side of the main parking lot, off of Jane Street between Norwood Avenue and Avro Avenue. Re-entry is not allowed for day parking vehicles. Lockers are located at the Front Gate adjacent to Canada's Wonderland Store and inside the entrance of Splash Works. The all-day rental fee for these lockers ranges from $17 to $30 depending on the size of the locker and the time of the season. Canada's Wonderland assumes no liability for items in the locker. Some attractions may close in inclement weather until conditions permit safe operation. Please enjoy a live show, meal or shopping until such weather passes. Canada’s Wonderland cannot issue rain checks or refunds for inclement weather. Does Canada's Wonderland have automated tellers (ATM's)? Please refer to our Park Map for exact locations of ATMs. No outside food, beverages or coolers are allowed to be brought into Canada’s Wonderland. However, baby food and formula are permitted as is plastic bottled water. Guests with baskets, coolers and personal picnic items are welcome to use the public picnic pavilion located just outside our front gates. Those with medical dietary needs will be considered. Guests are encouraged to visit our Special Dietary Needs webpage and/or contact Guest Services at (905) 832-8131 prior to their visit for more information about options available to guests. No need to panic. We can have your tickets printed for you at any Ticket Seller's window or Guest Services. You will need the credit card you used to purchase the e-ticket and your confirmation number. Do you have any baby care centres at Canada's Wonderland? Baby bottles can be warmed up in most of our restaurants as well as our Baby Care Centres located in KidZville and Medieval Faire. Diaper changing areas and/or family restrooms are also available in the Park. For the exact location of each facility, please check our Park Map. Do you have a lost and found centre? All items that are found arrive at our Lost and Found Centre beside our Lockers & Stroller Rentals which is located at the Front Gate adjacent to Canada's Wonderland Store. If you lose an item on a ride, please notify a ride attendant and go to our Lost and Found to file a Lost and Found Report. In order to keep the ride in operation, an immediate search is not possible. If you have found an item in the Park, please notify security personnel. Do you allow pets at Canada's Wonderland? Only guide dogs / service animals are permitted in the Park. Canada’s Wonderland provides an air-conditioned facility where guests may keep their pet (dogs and cats only) during their visit for a daily fee of $6. This self serve facility requires that pet owners provide care for their pet including water, food and exercise. The facility is equipped with a water faucet, bowls and kennel cages for guest use. Pets must be kept in one of the provided cages. For the comfort of your pet they must be able to stand and turn around in the cage. The largest cage available is 71cm (H) x 116cm (W) x 68cm (D). Please do not leave pets inside your vehicle. For our guests convenience we offer single and double strollers for one day rental. All rentals are on a first come basis and may not be reserved in advance. The rental fee for a single stroller is $15.99 plus tax (+$5 refundable deposit) and for a double stroller is $25.99 plus tax (+$5 refundable deposit). The deposit is refunded upon the satisfactory return of the stroller. A limited number of wheelchairs and electronic convenience vehicles (ECV) are available for one day rental. All wheelchair/EVC rentals may be secured online in advance of your visit, or at the Park while supplies last. It is recommended that guests bring their own wheelchairs. A one day rental of a manual wheelchair is $15.99 plux tax (+ $5 refundable deposit) and an ECV is $49.99 plus tax (+ $50 refundable deposit). The deposit is refunded upon the satisfactory return of equipment. What are the benefits of getting a Season Pass? Owning a Season Pass has its perks! Enjoy exclusive perks with your Season Pass including exclusive ride times, early entry to Splash Works, discounts on food, merchandise, and much more! View all the great benefits of a Season Pass. Guests can receive full credit on their admission towards the purchase of a 2019 Season Pass. Stop by any ticket window at Front Gate for details during your visit. Upgrading your admission towards a 2019 Season Pass must be done during the same day of your visit. If you forget to bring your Season Pass, please proceed to the Guest Services window located at Front Gate. A replacement fee will be assessed if you lose your Season Pass. Admission tickets and Season Passes are non-refundable and non-exchangeable for any reason after the order transaction is complete at Front Gate, online through our website, by phone or when purchased at a participating retailer. This includes weather related events. We do not issue rain checks. Please check local weather conditions prior to planning your visit. Guests under the age of 3 do not require an admission ticket to Canada’s Wonderland. Any guest that is 3 years of age or older requires an admission ticket. Does Canada’s Wonderland offer a military discount? We are pleased to offer a discount off the regular Front Gate admission price to active members of the military. This discount is available only at the Park and is valid for up to six (6) family members. A valid military ID must be presented to receive this offer. If you wish to leave the Park and return on the same day, please have your hand stamped at Front Gate. Re-entry is not permitted during Halloween Haunt or WinterFest event nights. 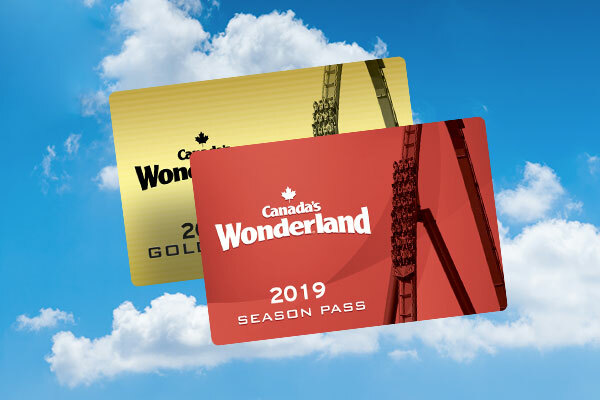 Canada's Wonderland offers a discount for seniors (age 65 and older) on both general admission and Seasons Passes. Canada’s Wonderland is not responsible for any inconvenience or financial loss due to unauthorized duplication and/or resale of tickets on websites such as The Red Deals, The Next Deals, The Group Deals, Kijiji and other auction sites. Guests are advised to be wary of discounted ticket deals from individuals, third party websites, apps or social media. Purchase tickets at our official website, at the Park’s front gate or with authorized ticket dealers such as Costco, Perkopolis, Venngo, CAA, AIR MILES or GroupON. If anyone has concerns about the validity of their ticket or a dealer, please call Guest Services at 905-832-8131. Are cameras and cell phones allowed to be used on rides and slides? For safety reasons, we cannot permit the taking of pictures, videotaping, and filming of any kind on any ride except Swan Lake, KidZville Station and Jokey’s Jalopies. This includes the use of GoPro style equipment, mounts and harnesses. All cameras and cell phones must be safely secured in cargo pockets, a waist pack, in a bin on the ride platform, left in a locker, or with a non-rider. Ride attendants cannot be responsible for items lost, stolen, or damaged while riding. Due to the potential for water damage, Riptide, Timberwolf Falls and White Water Canyon riders should leave their cameras and other valuable items with a non-rider on in a locker. “Selfie Sticks” are not permitted on any ride. 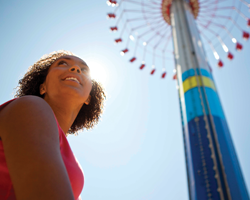 A guest's height is an important safety factor on many rides and attractions. Children can be measured at our Height Check Stations located on either side of International Street. Colour-coded wristbands are provided at these locations and correspond to the colour found on the Rules and Regulations signs located at the entrance of each ride. For the safety of your child, shoes that contribute excessively to height should not be worn. We reserve the right to ask that shoes be removed to ensure that a child’s height is not being artificially enhanced or manipulated. If the Height Check Station is closed, a wristband can be obtained at the station of any ride as long as the guest meets the height requirement of that ride. All passenger restraint systems, including lap bars, shoulder harnesses, and seatbelts must be positioned and fastened properly to allow guests to ride. Due to rider restraint system requirements, guests of larger size (in terms of height, weight, and/or body proportions) may not be accommodated on some of our rides. Our larger guests may experience difficulty on: Backlot Stunt Coaster, Behemoth, Dragon Fyre, Drop Tower, Flight Deck, The Fly, Ghoster Coaster, Leviathan, Lumberjack, Mighty Canadian Minebuster, Psyclone, Riptide, Shockwave, Skyhawk, Sledge Hammer, SlingShot, Soaring Timbers, Swing of the Century, The Bat, The Fly, Thunder Run, Time Warp, Vortex, Wilde Beast, and WindSeeker. If you are concerned whether or not you can be accommodated safely on a ride, test seats are located at the ride entrance of: Behemoth, Leviathan, Lumberjack, and Skyhawk. For other rides, you may enter the ride via the exit to ensure the restraints function properly prior to waiting in line. The rest of your party may wait for you outside the exit. First Aid is located in Medieval Faire beside the Spinovator ride and is staffed by certified Emergency Medical Technicians (EMT) at all times. If you need medical assistance please tell any Park employee and he/she will call First Aid and have an EMT dispatched to your location. Medication cannot be dispensed to minors without parental consent. What security procedures are implemented at Canada's Wonderland? Sharp objects (including pocket knives and metal chains), firearms, or other items that could be considered a weapon are strictly prohibited. Canada's Wonderland does not tolerate guests who fight and/or harass other guests while on our property. People who engage this behaviour are subject to being ejected and potentially banned from the Park, and may be subject to arrest by local police. All guests under the age of 30 will be required to provide valid government issued photo I.D prior to the sale of any alcoholic beverage. As per the Liquor License Act of Ontario, Canada’s Wonderland can deny the sale of any alcoholic beverage to a guest who is showing signs of intoxication or public drunkenness. Any guest who Canada’s Wonderland determines to be intoxicated will be removed from the premises. Cannabis and related paraphernalia are not permitted on Park property at any time. Canada’s Wonderland is a family entertainment facility and safety is our number one priority. Rides will close due to extreme temperatures and adverse weather conditions - particularly heavy rain, high winds and/or lightning. This is to ensure that the safety of all our guests is not compromised in unpredictable weather. A dashboard located inside Front Gate Guest Services can provide information on which rides are in operation. A specific answer as to when closed rides will return to operation is not possible because varying degrees of inclement weather cause different effects on different rides. Please be assured that Canada’s Wonderland makes every effort to reopen the rides as quickly and safely as possible after the adverse weather conditions cease. No refunds or rainchecks will be issued due to adverse weather conditions. MasterCard, VISA, American Express, Interact Direct Payment, US and Canadian traveller’s cheques are gladly accepted for admission. WeChat Pay and Alipay are accepted at the Front Gate only and not available once inside the Park. For more information, please stop by Guest Services located at the Front Gate and in Kidzville. Line Jumping is defined as “CUTTING IN FRONT OF OTHER WAITING GUESTS, LEAVING THE LINE THEN ATTEMPTING TO RE-ENTER. THIS INCLUDES USING THE RESTROOM FACILITIES OR TO PURCHASE FOOD OR DRINKS.” Once you leave your place in line, you have forfeited it, no matter what the reason. Saving a place in line is simply not permitted. What is Canada’s Wonderland’s Mission Statement? Canada’s Wonderland is dedicated to providing our guests with world class thrills, fun, and family entertainment, guided by the principles of safety, service, courtesy, cleanliness and integrity. Guests wearing bathing attire with metal buttons, rivets, zippers, or snaps will not be permitted to ride Lakeside Lagoon Slides or Splash Station Slides. Due to the design of Muskoka Plunge, only designated swimwear specifically designed for aquatic use is permitted on this attraction. Swim wear with exposed zippers, buckles, rivets, or metal ornamentation on back, sides, or front of swim wear is not permitted. No foreign objects are allowed in pockets. Absolutely no jewelry can be worn while riding the slide. This is including but not limited to piercings of any type (including cartilage piercings), necklaces, rings, bracelets, etc. The minimum weight limit for Muskoka Plunge is 45 lbs. and the maximum weight limit is 300 lbs. Footwear is not permitted on Splash Works attractions. Aqua socks and aquatic style footwear are permitted on Lazy River, Riptide Racer, Super Soaker, and The Plunge. When exiting Splash Works, shirts, shorts, and shoes are required. If you do not have appropriate bathing attire, swimsuits and other aquatic gear can be purchased at Muskoka Beach Wear. Glassware and similar material with a tendency to shatter on impact are not permitted in Splash Works. Splash Works and Canada’s Wonderland is a smoke-free environment. Smoking is only permitted in designated smoking areas. Please secure all loose articles, including hats, glasses, and jewelry when riding. Cameras, cell phones and video recording devices may not be used on any attraction or in any changing area or restroom. According to crowd size, time at the water attractions and access to Splash Works may be limited. In an effort to provide a safe and enjoyable water park experience for our guests, Splash Works routinely utilizes training exercises to improve our lifeguards’ skills and vigilance. These exercises will occur during normal operating hours and may consist of the following: submersible water mannequins, the use of video surveillance equipment, internal and external audits, active/inactive water rescues and/or first aid scenarios. Splash Works provides a full day of fun in the sun! To make the most of your day, be sure to drink plenty of water in order to avoid heat exhaustion. Drinking fountains are located near each restroom. Don’t forget to apply sunscreen frequently throughout the day. If you happen to forget your sunscreen, Muskoka Beach Wear and various merchandise locations throughout the Park have a variety of sunscreens and sundries available for purchase. Lifejackets are available for use throughout Splash Works. Lifejackets are complimentary and are available to any guest wishing to use one. Children, first-time swimmers, and weaker swimmers are encouraged to wear a lifejacket. Lifejackets are available for all guests needing special consideration. Some attractions require children below a specific height to wear a lifejacket before participating in the attraction. Aquatics staff and lifeguards reserve the right to impose the use of lifejackets as needed. For specific attraction requirements, please check out our Guest Assistance Guide. Guests are permitted to wear their own lifejacket as long as they are Transport Canada, Oceans and Fisheries Canada, or Canadian Coast Guard approved. Every owner and every operator of a Class A pool shall ensure that there is a process in place to ensure a guardian or designated person supervises children under 10 years of age. The process must include a swimming competency test and a method of communicating the requirements of the process. O. Reg. 494/17, s. 13 (10). As there isn’t an opportunity to determine swimming competency in the waterpark environment, we will be requiring that all users under 48” in height and under 10 years of age wear a lifejacket/PFD in both White Water Bay and the Lazy River. Lifejackets are available throughout the waterpark on a first-come, first-serve basis. Guests are able to use their own lifejackets as long as they are Transport Canada, Oceans and Fisheries Canada, or Canadian Coast Guard approved. The First Aid Station is located next to the Splash Works entry gate. If you need any assistance during your visit, do not hesitate to stop by the First Aid Station, or notify the nearest lifeguard. Our team would be glad to assist. Upon arriving, we recommend selecting a meeting place such as the First Aid Station, in the event you or your child becomes lost or separated from your party. In the unlikely event that your child becomes separated, please alert an associate. Public address pages cannot be broadcast inside Splash Works. If you happen to lose an item or leave an item behind while visiting, please drop by the First Aid Station during regular operating hours. After hours, please visit our Lost and Found Centre beside our Lockers & Stroller Rentals which is located at the Front Gate adjacent to Canada's Wonderland Store. Splash Works is committed to providing all of our guests with an enjoyable visit. Guests with disabilities are encouraged to visit our Guests With Disabilities page for detailed information on the requirements of each attraction, along with the programs that Canada’s Wonderland and Splash Works offer. A water wheelchair is available for guests requiring additional assistance when at Lazy River or White Water Bay. The water wheelchair may be used by multiple guests on the same day. During your visit, please speak to a member of our Aquatics management team to obtain access to the water wheelchair and for further accessibility information. For your convenience, lockers are located next to the Splash Works entry gate. Various locker sizes are available for all of your personal belongings. Locker rentals are automated and can be paid using cash, and credit cards. Debit cards cannot be used at this time. The lockers work with electronic pin codes and will allow unlimited access throughout the day. Locker access is available until both Splash Works and Canada’s Wonderland are closed for the evening. Canada’s Wonderland cannot be held responsible for lost or stolen items. Relax and enjoy the privacy of your own wave side cabana. A limited number of exclusive cabanas are available each day and often sell out. Visit our Cabana page for more information and to make a reservation. Please note that tents, beach umbrellas and shade structures are not permitted inside Splash Works. Guests may make use of the permanent umbrellas or shaded areas provided by the Park or they are welcome to rent one of the Park Cabanas.